Harris was born in 1920 a stone’s throw from the current location of the Grant Museum. His father was a jeweller and Harris was born in a room above his father’s shop. At age 16 he took up a post at the Wellcome Museum of Medical Science where he stayed until the second world war broke out when, in 1939, he joined the Navy in a medical capacity until 1943. During his time with the Navy, Harris worked aboard RNH Haslar, HMS Colinwood and on the Royal Netherlands Navy Hospital Ship HMHC Ophir, Eastern Fleet. 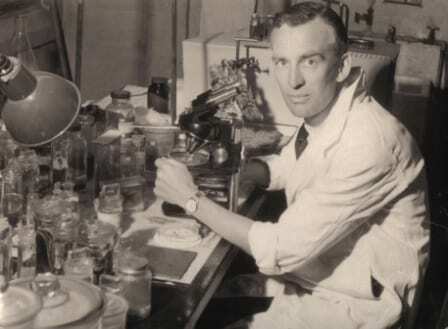 In 1946, Harris returned to his position at the Wellcome Museum, but s0on after relocated to the Zoology Department at UCL as a teaching technician. Harris was a technician at UCL for around a year, at which time D.M.S.Watson was Chair of Zoology and in charge of the collections that now constitute the Grant Museum. Harris desperately wanted the position of curator for the collections and pitched the idea to Watson who was hesitant about a non-academic taking up the position. Harris persuaded Watson to give him a dry run. After only a short time Watson was so thrilled with Harris that he left him to it and so was born the post of a dedicated curator of the collections. From its inception in 1828 until this point 120 years later, the care of the collections had always rested with the Chair of Zoology. As of 1948, the post of Chair of Zoology and the role of curator diverged and remains a separate position to this day. D.M.S.Watson retained position as Chair, with Harris as curator. Harris seemed a great asset to the collections with ‘much new skeletal material being prepared, the collections were overhauled and the mammoth task of reclassifying and recataloguing was begun’ (1). Harris was keen on experimenting with new methods of preparing specimens, which he expanded upon during his time at UCL, and was well known for his work embedding specimens in resin. Whilst at UCL, Harris began teaching evening classes at Paddington Technical College (now Westminster University) in which he trained natural history technicians. Having spoken to two subsequent curators that at one time or another worked with Harris, it seems that the facilities at PTC at the time left a lot to be desired. Wax is (literally) hard to work with when no-one remembers to heat it before the class. When Roy Mahoney (curator number eight) took over the classes from Harris, he and Harris moved the materials to UCL in order to utilise the facilities there instead. A wise move it seems. Attending these evening classes at the time was a young lady by the name of Rosina Down. She was taught by both Harris and Mahoney and the move of the evening classes to UCL was her first introduction to the collections that she would go on to curate herself as curator number nine. Harris was curator of the Grant Museum collections for eight years. 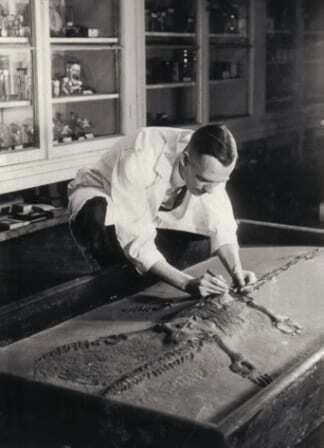 He left in 1956 to take up the post of experimental officer at the BMNH, now the Natural History Museum, London. 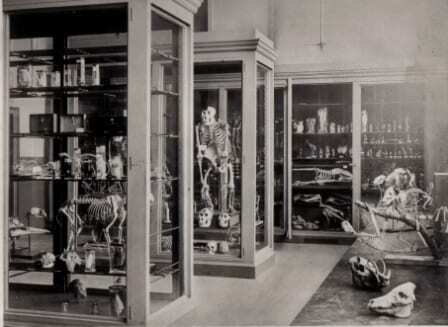 Whilst at the BMNH, Harris set up the ‘experimental laboratory’ and, after listening to a lecture on specimen preparation by the Naval physicist Dr Meryman, began to experiment with freeze drying specimens. It is for this method of preparation that Harris is most well known and the technique was used by a subsequent curator of the Grant Museum to freeze dry a number of our specimens. Harris’ reputation for skills in this area spread such that ‘the arrangement of spring flowers buried in Westminster Abbey in 1977, as part of the Queen’s Jubilee Year celebrations, were freeze dried by Reg [Harris]’ (1). 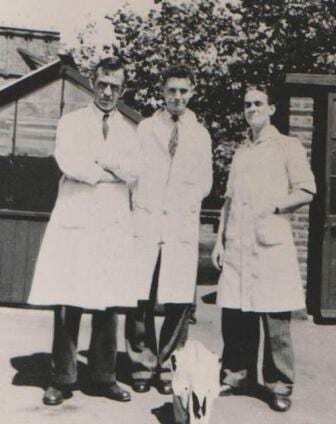 Harris and the other museum staff are shown here on the right in their open air lab. The lab comprised the roof of the Medawar building at UCL, and was used ‘as a preparation area for smelly procedures’. The horse skull at the bottom of the image was left to rot clean on the roof, and is highly likely the one on display in the collections today. In 1980, Harris retired which in his case, meant taking up another curator position, this time at Alderney Museum on the Island of Guernsey. Harris was awarded the Foster Memorial Prize for Bacteriology and the Fotherham Prize for Geology. Harris passed away in 1987. Rosina Down, a former student of Harris and former curator of the Grant Museum, wrote of him ‘It was said of E. Ray Lankester (a former Professor of the UCL Zoology Department and Director of the BMNH) that “he influenced the whole course of Zoology in the British Empire”. I think the same could be said of Reg Harris’s influence on the course of practical biological techniques.’ A glowing account of a teacher and mentor, clearly admired and well respected in his field. 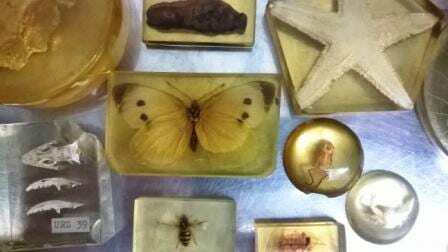 At the Grant Museum we have a number of specimens that have been preserved in blocks of resin. They include both vertebrates such as snake skulls and whole frogs, as well as invertebrate specimens including starfish and butterflies. Examples of these are shown in the image on the left. Although it is not known who made these resin preparations that belong to the Grant Museum, it is highly likely that they were made by Harris. This preparation technique is irreversible and in the modern day is primarily used for making trinkets such as keyrings and paperweights rather than for specimens in museum collections.